In its perfect form, science isn’t supposed to be competitive. But human nature frequently intervenes, causing scientists to fall short of this ideal cooperative goal. However, sometimes scientists can set aside ego, greed and nationalistic pride to work together on some of the most important science projects – whether they’re trying to find the Higgs boson, decipher the human genome or stop an outbreak of Ebola virus. 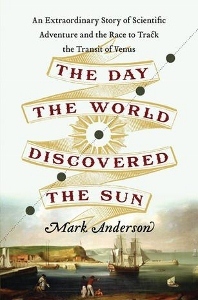 In The Day the World Discovered the Sun, author Mark Anderson tells the story of the first big international science project, the multinational effort to accurately document the transit of Venus across the face of the Sun. Obviously, Venus is always moving across the face of the Sun from some perspective, but for viewers with feet firmly planted on the planet Earth it’s a rare event. It tends to occur every century or two in paired appearances, separated by about eight years. It happened just a few months ago and also in 2004, but this book focuses on the transits of 1761 and 1769. Thanks to the laws of planetary motion deduced by the great German mathematician and astronomer Johannes Kepler in the early 17th century, 18th century astronomers had plenty of time to prepare for these upcoming events and the scientific societies of numerous countries placed the measurement of the transits high on their list of priorities. The motions of the sun, moon, planets and stars were a big deal to the 18th century sea-faring nations because maritime navigation was completely dependent of the ability to measure, predict and utilize all sorts of astronomical data. Many a ship laden with a fortune of gold, silver or spices ended up on the bottom of the ocean because the navigator had miscalculated the ship’s location, leading to a close encounter with an unexpected rocky shore. Kepler’s laws allowed for the determination of the relative distances of each of the planets from the sun based on the period of their orbits, but some sort of external data was necessary to convert this data into absolute miles or kilometers. The transit of Venus presented the perfect opportunity to finally comprehend the entire solar system in all its glory. Viewing the transit from different spots on Earth’s surface would provide the necessary data to allow for a determination of the exact distance from the Earth to the Sun, but everything would have to be perfect. The locations had to be far enough apart, each viewer had to know his latitude, longitude and the time of day with precision and the skies had to be clear. Each one of these details had to be flawless or the entire effort would be for naught. After describing how the observations of the 1761 proved unsatisfactory, the author focuses on three of the primary expeditions launched to document the 1769 transit, although hundreds of other amateurs and professionals took measurements to lend a hand. The rookie Captain James Cook was sent from London to Tahiti with the Venus transit as his primary mission. He subsequently searched for Antarctica, discovered New Zealand and mapped much of Australia as an afterthought. Having survived a trip to Siberia for the 1761 event, Jean-Baptiste Chappe d’Auteroche, a renowned French astronomer, traveled across the Atlantic and across Mexico to Baja California to make his observations. Lastly, two Hungarian Jesuit scientists, Maximilian Hell and Joannes Sajnovics were invited by the King of Denmark to travel to the northernmost islands of Norway, well north of the Arctic Circle to take their measurements. 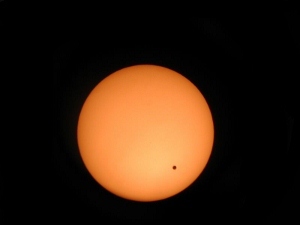 Venus transits the Sun in 2004. Over 220 pages, the book builds up to the big event, moving back and forth between each expedition and including many of the controversies and accusations that are part of the backstory to any big project. Anderson’s descriptions are engaging and he does a nice job of explaining why so many people risked their lives for a goal that may seem rather insignificant to the modern Earthling. The efforts these men went to in order to make impeccable measurements were truly amazing. Avoiding formulas and math in the main text, the author includes a detailed mathematical appendix to explain the calculations for readers who are interested. While I only place him in my middle tier of science writers, Anderson tells an interesting story about a subject of which I knew next to nothing. The Day the World Discovered the Sun is an entertaining read for anyone interested in astronomy or the history of science. In this day and age it’s hard to imagine that so many people would risk so much for the glory of science.